Written by SBMAA Webmaster on January 1, 2017 . Posted in SBMAA. Salaam to all doctors, nurses, therapists, and medical professionals. 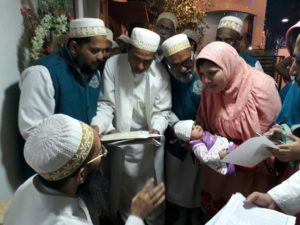 With the khushi and farman of Aliqadar Moula (TUS) and under the guidance of Shezada Taha bhaisaheb and Shezada Qusai Bhaisaheb, for medical upliftment of mumineen, Burhani Medical Idara began an immunization drive and healthy drinking water drive across India. Living in the USA, these are issues that we may take for granted for most of our lives. But in India, the reality is that children are still affected and die at high rates from vaccine preventable illness, like rotavirus, polio, pneumonia, and measles among other illness and causes. Moulana’s (TUS) ehsaan and nazar reaches all of us, His children. He has graciously given raza to immunize mumineen children under 16 years old with the recommended vaccine schedule (shown below). 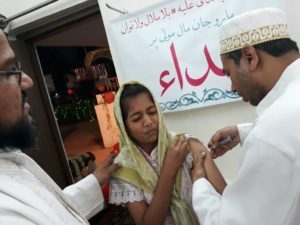 Currently across India, 17,647 mumin children have been registered for vaccination and are in need of some combination of vaccines to be administered. This registration is fluid and continues to rise. These vaccines will be provided FOR FREE! 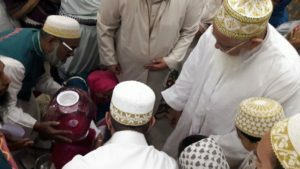 In addition, doctors and medical staff performing these vaccine drives are working to ensure that all mumineen have healthy drinking water in their homes. Mumineen lacking clean water are supplied with a basic water filtration system. As you can imagine, this is a MAJOR undertaking both physically and financially. Most of us in the USA are unable to travel to India and offer our khidmat with these medical camps. However, we are given the opportunity to participate and perform khidmat financially by providing funds to acquire all these vaccines. Current vaccine budget is 3,725,000 INR = $56,439 USD. There are many other expenses including water filtration systems, supplies, etc that need to be funded as well. OUR GOAL AT SBMAA IS FOR NORTH AMERICA (USA AND CANADA) TO PROVIDE FUNDS FOR ALL VACCINES AT $56,000 USD. In order to meet this goal we are requesting a contribution unit of $1,100 USD, but you may contribute any amount. Let us meet that goal, Insha Allah, and araz to Ali Qadar Moula (TUS) our commitment to the upliftment and better health for mumineen around the world. Vaccine administration has already begun. Please pose your commitment to your local SBMAA masool ASAP. If you have questions, please contact your local SBMAA masool or email Dr Mufadal Moosabhoy (laddafum@gmail.com). You can also contribute via Chase Quickpay, Google Wallet, and Paypal to Dr Mufadal Moosabhoy at laddafum@gmail.com. Funds donated electronically will NOT be tax deductible. Written by SBMAA Webmaster on August 6, 2016 . Posted in SBMAA. Dear physicians and other healthcare professionals, Ashara 1438H are approaching fast. As you all know it is Moula Mufaddal’s (TUS) khushi and farmaan-e-aali that every mumin, mumina and farzand attend the 9 days of waaz and participate in Imam Hussain’s (SA) gham. To that effect, We would encourage all healthcare professionals to plan in advance so that your schedules can be cleared up for one of the most important events in the year. We write to you as physicians, who come from diverse practice models; from academia to private practice. In our experience, advance planning and notification can overcome most hurdles in taking time off from your practice. Kindly let your department chair or your administrator know about your religious commitment in advance. Speak to your colleagues now regarding call coverage and cross coverage. Let your hospital coordinator know if you take ER call for your specialty. Some sacrifices need to be made to remember Imam Hussain’s (SA) ultimate sacrifice. 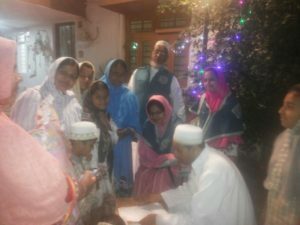 You may have to take call on Thanksgiving or work an extra weekend to pay back the favors but they are all worth the effort to do what is Moula’s khushi. Medical students, residents and fellows must also plan in advance and inform their program directors in advance. There is every likelihood that you would be granted the leave to practice your faith. Arrange for call coverage with your co-residents and fellows. Friends in private practice or even solo practice may be able to get cross coverage from other groups if negotiated in advance. Please use vacation days and sick days if need be to get time off. Ultimately, if you have to close your practice for a few days to devote yourself to what is most important then so be it. Allah is the guarantor of rizq and we are sure you will find the practice more successful when you return than when you left it. Please plan now and do not wait till the last minute. Finally, If you need a letter stating the religious event and the need to have time off, kindly contact your local jamaat office. We are also available to provide any supporting document or discuss specific situations and offer suggestions. Due to time crunch we may not be able to conduct official CME, however we can meet daily from 3:30 – 5:00 pm in a dedicated area with AV facilities and conduct medical lectures on topics of interest. This will also provide an excellent opportunity for networking. We will collect information of all physicians, dentists and allied medical professionals (practicing and students) and collectively present our khidmat and niaz to Aali Qadar Moula TUS. Subject to raza we may present ziyafat and qadambosi during Ashara ayyam. These initiatives will be coordinated by SBMAA. If you have not yet registered for SBMAA, please do so immediately at sbmedical.org/register so that you do not miss out on any critical information pertaining to these initiatives or other crucial details. You may also join the WhatsApp broadcast list by sending a Whatsapp message to Shk Aziz bhai Poonawalla on whatsapp at 832-654-5221. We also strongly encourage you to subscribe to SBMAA by entering your email address on the signup form and click the green “Subscribe” button on the left side of the sbmedical.org homepage.